What would you like to do in 2018? What would you like to experience this year? What would you like to accomplish, acquire, or complete? What would you like to explore or learn? What’s important to you? This book is a flexible guide for you to make this year whatever you’d like it to be. Inside are proven tools designed to foster whatever is important to you -- tailored to What would you like to do in 2018? What would you like to experience this year? What would you like to accomplish, acquire, or complete? What would you like to explore or learn? What’s important to you? This book is a flexible guide for you to make this year whatever you’d like it to be. Inside are proven tools designed to foster whatever is important to you -- tailored to your unique circumstances and preferences. It’s actually two books in one. It begins with a Self-Guided Seminar you can work through at your own pace to: *	reflect on what you experienced in 2017 *	generate ideas for all areas of your life for 2018 *	identify your current top priorities *	make achievable plans for 2018 Next you can customize the Planner/Calendar section to: *	implement your unique plans for 2018 *	monitor your progress *	make adjustments as needed *	keep yourself on track It’s developed by Liisa Kyle, Ph.D., an author and life coach who specializes in helping people get organized, get things done, and get more out of life. Over the past twenty years, she’s coached individuals, facilitated groups, and delivered inventive workshops on four continents. 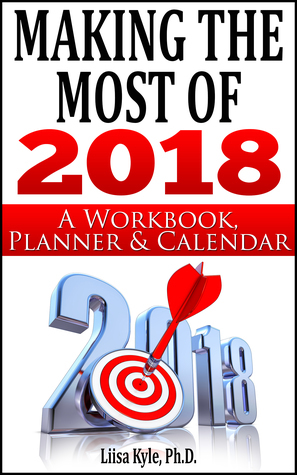 She’s developed this workbook to help you make the most of 2018. Give yourself -- or someone else -- the gift of a wonderful 2018.